It’s been a pulse-racing few weeks for team adidas as we counted down to hosting our first global event for the brand – the launch of adidas Athletics Z.N.E. Pulse Collection. The global launch event took place in London’s P3, where over 250 media and influencers from all over the globe witnessed 31 world-class athletes including Gabriel Jesus, Alvaro Morata, Tori Bowie, Desiree Henry, Stuart Broad and Anthony Watson unveiling the new product range for the first time. 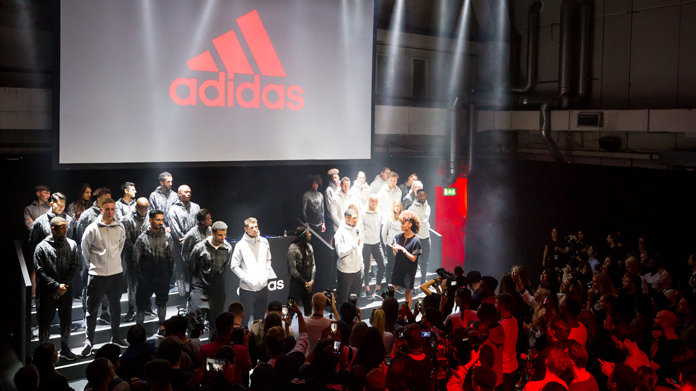 Alongside an epic stage show hosted by New Yorker and adidas global ambassador Ally Love, guests were styled by street styling studio Street Etiquette, and could get a feel for how athletes prep for a big game with a pop-up barber shop and three stripe nail salon. We even recreated the adidas Creative Lab where designers from the brand could talk guest through how the Z.N.E. Pulse Collection went from concept to reality. At the centre of the Collection is a heartbeat knit pattern that is inspired by the rising heartbeat of athletes before a game, and created using unique data collected from adidas athletes. To give guests the feeling of being an adidas athlete (even for one night) we recreated the athlete game day. Guests entered through an athletes Locker Room filled with players’ own kit and inspirational mantras before being led into a purpose built immersive tunnel that re-created the pre-game moments of anticipation, complete with the sound of a roaring crowd, racing heartbeat and stadium lights. And to ensure a unique take out from the event, all guests’ heartbeats were recorded through the night via heart-monitoring wristbands enabling us to capture the pulse of London that will be turned into a limited edition t-shirt that is on sale soon. And whilst much fun (and many haircuts) were had by our guests who danced into the late hours, backstage we managed over 50 interviews and numerous photo shoots with our athletes and media from a far afield as USA, China, South America, Japan, Korea and Mexico. The UK contingent held their own, with 50 media and influencers coming to the event, with coverage lined up for the likes of High Snobiety, Soccer Bible, Hypebeast, LOOK, and Coach to name a few.